Meanwhile, the Cavs team he left behind is enduring Year One of what could be a grueling rebuild. I know for a fact many in Cleveland wouldn’t hesitate to admit they miss James. You can’t look at this year’s eleven-win Cavs team and claim you think it’s better off without the league’s best player. However, the current mess occurring in L.A. makes me wonder if this feeling is mutual. Though the reasoning behind James’ latest departure made sense at the time, you can’t help but think he might be regretting the move. To clarify, I’m not writing this to rub the Lakers’ troubles in James’ face, nor would I celebrate the idea of him second-guessing this summer’s exit from the Cavs. I personally completely understand why he chose to leave, and hold no ill-will towards him despite the current state of the team he left behind. I’m just wondering what his mindset is as things appear to be crumbling around him during his opening season in Los Angeles. When he joined the Lakers, the assumption was pairing him with up-and-coming talent like Lonzo Ball, Kyle Kuzma and Brandon Ingram could make for a solid core. Deciding to complement this with combustible players like Lance Stephenson, JaVale McGee, Michael Beasley and Rajon Rondo seemed strange on the surface, but James seemed to embrace it. In the time since, said young core is both under-performing and now represents desperate trade-bait as Los Angeles attempts to pry Anthony Davis away from the New Orleans Pelicans. If the team fails to move the younger players, it’s safe to say life after the trade deadline will be awkward. Meanwhile, rumors ran rampant regarding a heated confrontation this past Saturday between Laker veterans and coach Luke Walton. I’m certainly not shocked by these developments. Frankly, nobody in Cleveland should be. After all, we’re only a year removed from the Cavs burning the midnight oil and trying to get rid of ill-fitting players with the hopes of salvaging what was, at the time, a miserable season. Chaotic mid-season drama appears to go hand-in-hand with having James on your roster. Still, many seemed convinced the Lakers were the ideal spot for him this summer. While it’s far too early to call his move a mistake, it’s certainly off to a rougher start than anyone could’ve imagined. It’s important to note here that the Cavs, even with James added to the current roster, likely wouldn’t win a championship. They’d have made a good run, potentially even as far as the Finals. However, there’d once again be no toppling of the Golden State Warriors. James likely wouldn’t have avoided drama had he stayed home, either. His strained relationship with owner Dan Gilbert would still be a factor. If I had to bet, I’d assume he’d even push the front office to trade rookie Collin Sexton for win-now assets. Bottom line – life wouldn’t have been perfect for James had he turned down Los Angeles and stayed in Cleveland. That said, everything about the Lakers’ roster which was billed to be perfect for James is either being shoved onto the trade market or on the verge of imploding. While the length of his contract ensures the team has time to correct these issues, the amount of uncertainty surrounding it right now is astounding. It’s certainly not what we were told to expect when James left Cleveland behind. 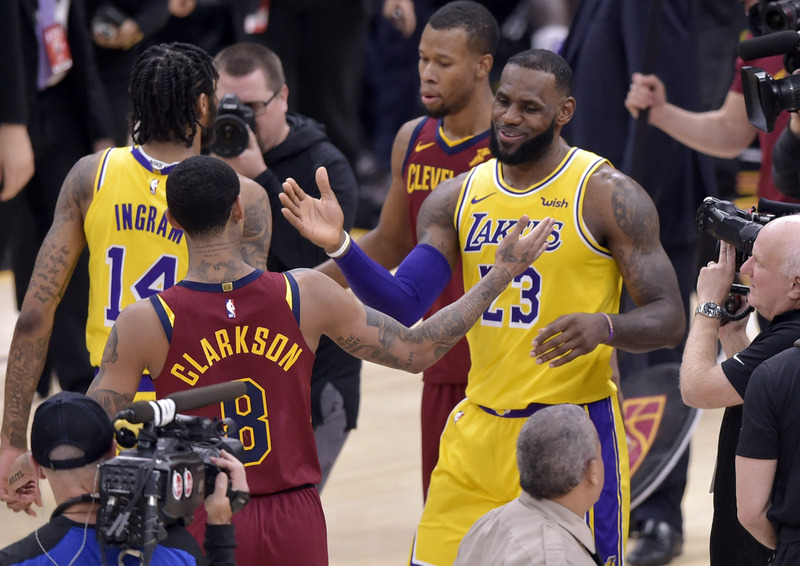 Many outside of northeast Ohio billed it as an obvious move, claiming the Lakers were far more appealing than staying with the Cavs. Yet, here James is, seemingly pushing Los Angeles to trade the young core and cast of oddball vets he appeared very happy about just a few months ago. For all intents and purposes, his first season with the Lakers will be a wasted year. It sure makes you wonder if this is leading to some second-guessing on his part. If he’s wondering where he’d go if he could do it all over again.